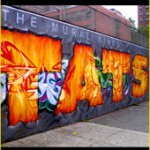 TATS CRU is a group of Bronx-based professional muralists have spearheaded the battle to change people’s perception of graffiti art. Some of their success is evidenced by their recent work for public schools and universities where they lecture and teach mural art classes. In addition, TATS CRU furnishes advertising and design services to businesses reaching out to young urban consumers and companies seeking new innovative ways to promote their services and products. TATS CRU has been featured in the New York Times, New York Magazine, USA Today, VIBE, The Source, Details, as well as many other publications. Their art has been included in a variety of books including Spray Can Art, The Art of Getting Over, and R.I.P: Wall Memorial Wall Art, where the TATS CRU work was used for the cover.